Farm opens September 28-November 3, 2018 for Fall & Halloween Fun! Mon-Thurs 4-9 pm Fri 4-10pm and Sat 10 am-10 pm. Open all day Oct 18, 19 & 22, 2018. We have something for everyone! Pick-Your-Own Pumpkin Patch -- Hayrides -- Petting Farm -- Pony Rides -- Corn Maze & The Haunted Tale Hayride to name a few. Admission $9 (ages 3 and older) includes CORN MAZE, SILO SLIDE, petting farm, hayrides, giant slide, animal train, corn box, corn cannon and more! Pumpkin weigh off, October 13th at 11am. Did you grow something big or unique? 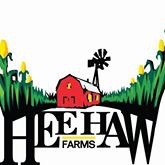 Free entries, email heehaws7@hotmail.com AND at the end of the season... Hee Haw Farms and the Giant Pumpkin Growers present the 9th annual Giant Pumpkin Drop. October 27, 2018 starting at 12 noon. It's a smashin' fun party dropping pumpkins. Raising donations for the #carelikekeat foundation. Helping teens in the community with school sponsorships and more. Bring your friends & family on a thrilling Haunted Tale Hayride. A hayride in the moonlit night and an eerie cornfield offer a great combination for a haunted thrill. A thrilling haunted tale told as you drive through the field. Next stop...exit the wagon into the haunted corn maze! Add on to general admission just $7. Runs Mon, Fri & Sat nights from 8-close. Also open Thurs, Oct 18th.